Flying is by far my favourite of remote control hobby's but it can be a hassle transporting. In my Field Box project there is a special compartment (60CM length by 30CM depth and 10CM wide / 24"*12"*4") which is designed to house this 3D plane. The idea is the simplest of them all, create a 3D capable plane which can be flat-packed and stored INSIDE the field box. This means where ever the Field Box goes I always have a plane even if I take something else entirely to use that day! I think it's worth mentioning this is FaTedev`s first project entirely displayed here without needing to visit other pages. The plans I created in Photoshop using real photos of the plane scaled to fit in the field-box. You should print these in LANDSCAPE which will be 4 sheets of A4 paper in total. 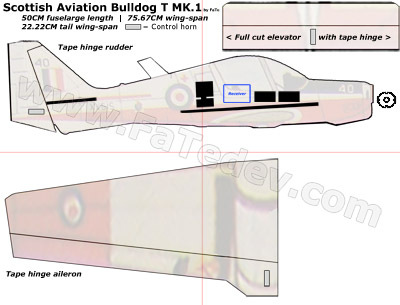 The design for this plane originates from a Scottish MK2 R.A.F Bulldog, I decided on this design as it's the first [u]real[/u] plane I got too fly back when I was in Air-Cadets and got too fly these at R.A.F Leeming. The specifications for the model build are very simple too ensure field repairs or anything else will be just as simple. [*] 6MM Depron sheets, I could use EPP foam but Depron is the way to go these days. [*] 2MM hollow carbon fibre rods for structural support. [*] 2 cell, 610 mAh 7.4v LIPO battery packs. [*] 4 Channel radio gear with micro receiver or similar. Even with on-board video recording devices I still easily exceed a minimum 50% thrust ratio with the ability to really fly fast at 157% excess. In part 2 I'll start by showing the basic stages of cutting out Depron, cutting our fuselage, wings and tail. Followed by cutting out control surfaces, using tape for hinges and mounting the electric motor in place. Important: I decided to start the build in part 2 because it's very important to explain my photographs will differ from the plans, as for this plane too fit in my field-box it needs to be shorter in fuselage length. This will vary my build to design specifications only in where the centre of gravity will be located. This was my own oversight as I fitted foam protection sides in the field-box which resulted in 6CM less space. SpeedFreak III set-ups. Different wings, motors, ESC, lipos and more!